Scalestick Scale Inhibitor Filter - Corrosion Prevention Filter | Applied Membranes Inc.
HydroBlend is a unique composition blended to provide superior limescale (calcium carbonate) prevention and corrosion control in water fed equipment. The system feeds a controlled amount of specially blended scale control compounds into the water stream. 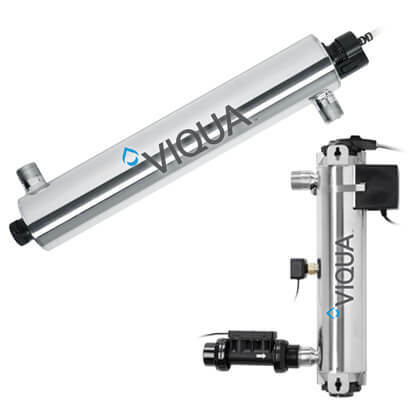 The SS-10 ScaleStick is a stand-alone cartridge that fits standard 10” water filter housings allowing them to be used in existing installations. No electricity, maintenance, or guess work is required. A simple glance at the cartridge indicates when replacement is needed. HydroBlend is unaffected by high temperatures, providing effective treatment for hot water equipment. 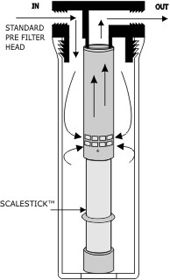 Although all ScaleStick cartridges allow water to flow at much higher flow rates than their rated service flow range, choosing the correct cartridge for the specific application will ensure proper feed rates and treatment duration. The preferred flow rate range is the average flow rate encountered in a specific application. For example, even though a household may occasionally flow 10 gpm if enough faucets or appliances are being used, the typical average flow in a residential application is one faucet on at a time or 1-3 gpm depending on the outlet. All applications are sized for the average flow rate encountered, not peak flow rates. NSF Certified: The SS-10 is Tested and Certified By NSF International against NSF/ANSI Standard 42 for material requirements only.